Energy Medicine is a branch of Alternative Therapy or Complementary Medicine. Methods involve working on the human energy field, the energy centers, and the life giving vital force energy. Through various learned energetic healing modalities, the practitioner’s goal should be to assist the client to stimulate their body’s own natural healing mechanisms. Depending on the techniques implemented and the various schools of thought behind one’s training, these sessions may vary quite a bit. Throughout our human history, many ancient cultures have acknowledged and identified energy centers in our body called Chakras. This is the East Indian Sanskrit word meaning “Wheels of Light.” These centers of activity receive, assimilate, and express your vital life force energy, often referred to as Prana or Chi. When the vital energy of these systems are flowing naturally and unobstructed, we tend to have a sense of balance and health. When they become unbalanced or blocked, it may lead to various degrees of disharmony and illnesses in our lives. 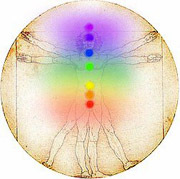 Surrounding and interpenetrating the Chakras and the physical body is what is know as our aura or human energy field. This holds our expressed and unexpressed emotions, feelings, and thoughts, as well as, our experiences. An Energy Healer helps to restore the natural flow of the vital life force energy in the body by working on energetic blockages. They allow themselves to be used as a channel for the flow of healing light and healing energies. This entry was posted in Uncategorized by Madhavi Kata Chalasani. Bookmark the permalink.